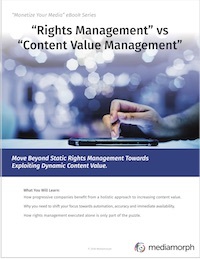 Move beyond static rights management towards dynamic content value. It has become an industry-wide challenge to track and classify content rights—often done so in spreadsheets and desktop databases—and to build a scaleable structure to enable distribution opportunities. Discover how progressive companies benefit from a holistic approach to increasing content value. Why you need to shift your focus towards automation, accuracy and immediate availability. How rights management executed alone is only part of the puzzle.